Reserve Bank Governor Philip Lowe has identified low wage growth as a drag on the economy in a speech to the National Press Club, saying “people worry about their own future and that of their children” because of weak and even negative wage growth, combined with globalisation and technological change. “The Reserve Bank Governor has today made it clear that fair pay increase aren’t just good for the people who get them, they’re necessary for our economy to run properly. I'm convinced these people are paid to make politically correct and politically useful statements, not make statements of basic truth and fact. Now, in an election year, the Reserve Bank - which is not 'owned' by the government but appears to be, in popular mythology - is coming out on the side of the 'workers of Australia' in the lead-up to an election.... last night they were talking about lowering interest rates... a silly idea that will promote more division and poverty and hidden inflation by propping up the failing serial housing market rather than 'allowing people to buy their own home'. Bizarre.. simply bizarre.... and all of this in the Year of The (Muslim Whine) Non-Pig.... Year of the Peccary? What about Year of The Guinea Pig or something to placate the Whining Mussos or just make it The Year Of The Invented Issues??? That scenario is the outcome when wages rise above the level of productivity. Low productivity is the reason for the stagnation of wages. I've been warning everybody on this board for years about our declining productivity and the consequences to follow. so far, I've been absolutely correct. How do you not work that one out? Who else is responsible for running the show? to make the workforce even more uncompetitive ?? More likely that Grapples does not understand productivity very well nor its relationship to real wage growth. Labour productivity has continued to grow in our domestic economy. Therefore business has not been lagging in capital investment and those investments have achieved the desired outcomes. On the other hand, capital productivity has been in serious decline for nearly two decades. The upshot of all this is that each increment of labour productivity growth is requiring greater amounts of capital as time moves on. Your view that management has been negligent is seriously misguided. 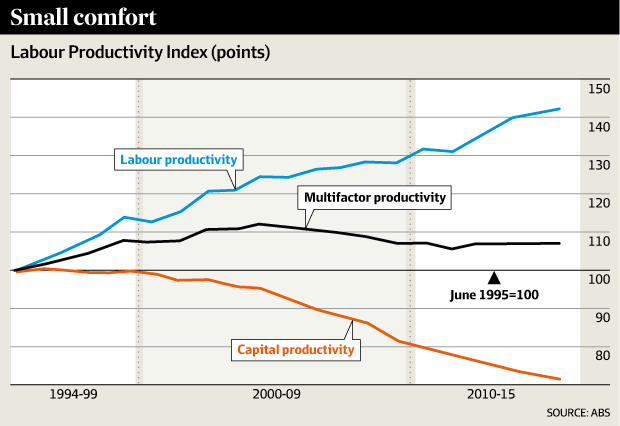 Once the sum total of capital and labour dips into negative territory ( multifactor ) expect to see a decline in capital investment and even labour productivity will hit the wall and real wages will actually decline. Productivity on the rise and wage growth in decline leads to a slowing economy, resulting from lower consumer spending which leads to a lack of business confidence. The LNP rush to a slave labour economy is now showing the results with a lack of business confidence. Australia does not need a pay-rise. What it needs is a reduction in being the most expensive country on the planet. Australia has the most expensive electricity, gas, mobile phone and internet bills. poor suckers here have no choice but to pay excessive prices for everything. YEP - AND CORRUPT ARSEHOLES LIKE WHITEKNIGHT WANT PEOPLE TO GET HIGHER WAGES BECAUSE IT MEANS MORE MONEY IN THE POCKETS OF THESE CORRUPT COMPANIES THAT CHARGE A FORTUNE. Actually, WhiteKnight is not a bad bloke. He just wants wage earners to have enough money left over to eat. That's admirable. Corporations and employers would like the same. There is no mileage in forcing wages down just for the hell of it. In the face of falling productivity there is no capacity to keep wages on the up without affecting employment, inflation or production. so I don't believe that's the case. Buy a textbook and read the chapter on productivity. Just because you do the work of 5 people does not mean there is 5 times the output. And if the corrupt WHITEKNIGHT had his/her way - he would have 5 little cheap Asian labour people do the job of 1 person and get paid x5 times as much!